Easy Web Gallery Builder gives you an opportunity to easily create great-looking HTML image galleries for the web, CD or local viewing. The program has an outlook-style interface, which makes it easy to use for anybody, including those, who have no idea of HTML coding and image processing. Easy Web Gallery Builder supports all popular image formats and uses advanced algorithms for resizing images and creating thumbnails. The user can to save and load his own gallery projects. Easy Web Gallery Builder 2.2.0.1 is a shareware program and can be used as a demo to try the software until the free trial period has ended. A full version of the program is available after the trial period ends. 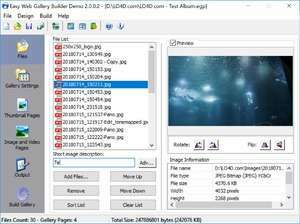 For security reasons, you should also check out the Easy Web Gallery Builder download at LO4D.com which includes virus and malware tests. Additional screenshots of this application download may be available, too.